There is a fascinating history of how this tale has been told for the past few hundred years. But I was first introduced to to it via an Urdu version of these adventures written/translated for young adults by Maqbool Jahangir. It has 10 parts (~200 pages each) and it is written in a style that once you start reading it, its hard to put it down. Yes, it includes giants, jinns, fairies, sea voyages, romances, and battles - all linked to Amir Hamza and two of his trusted friends. In fact, I got into the habit of reading books through this series and my siblings (and now their kids) had the same experience. I absolutely loved this epic and I still have these books with me. However, I read the young-adults version, and now a new translation of the adult version of Hamzanama has just been published and it is this that has been reviewed in the Times. This is incredible - the Moghul painting style came out as a result of this epic! More on the story below, but here are some of the paintings (and check out the exhibition website The Adventures of Hamza that has more paintings with excellent descriptions). 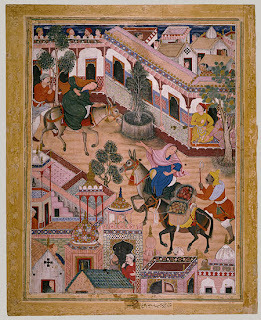 In this painting, Zambur, a spy, brings a maid named Mahiya to town on a donkey. 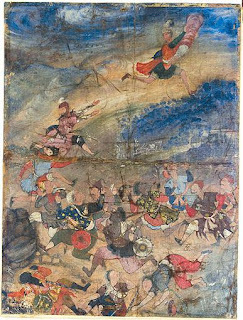 The “Hamzanama” was once the most popular oral epic of the Indo-Islamic world. 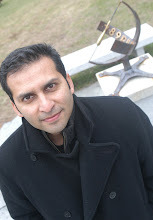 “The Adventures of Amir Hamza” is the “Iliad” and Odyssey” of medieval Persia, a rollicking, magic-filled heroic saga. Born as early as the ninth century, it grew through oral transmission to include material gathered from the wider culture-compost of the pre-Islamic Middle East. 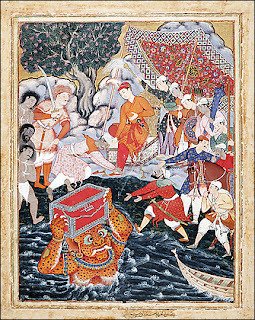 So popular was the story that it soon spread across the Muslim world, absorbing folk tales as it went; before long it was translated into Arabic, Turkish, Georgian, Malay and even Indonesian languages. It took particular hold in India, where it absorbed endless myths and legends and was regularly performed in public spaces in the great Mughal cities. At fairs and at festivals, on the steps of the Jama Masjid in Delhi or in the Qissa Khawani Bazaar, the “street of the storytellers” in Peshawar, the professional storyteller, or dastango, would perform nightlong recitations from memory; some of these could go on for seven or eight hours with only a short break. Alas - I did not hear this story from a dastango. But it is still cool to imagine how it would be like listening to an epic from a master story teller from memory - probably while drinking tea (and smoking hukkah in the older times). Although a fraction of the size of the 46-volume edition, this unabridged translated version still weighs in at an impressively heavy 948 pages. Even in translation, “The Adventures of Amir Hamza” is a wonder and a revelation — a classic of epic literature in an interpretation so fluent that it is a pleasure to sit down and lose oneself in it. The story line itself is endlessly diverting and inventive, and the prose of the translation is beautifully rendered. Read the full review here, and here is the author's website. If you like epics, this would be perfect summer reading. That sounds like the perfect thing to read after I finish Beowulf! I watched a Dastangoi performance recently and blogged about it. You might find it interesting to read. I didn't realise there was an Amir Hamza book in English, I'll see if I can find it in the bookstores!